While it can't come close to the Wrangler's iconic status and history, the Cherokee is a Jeep with a real legacy and following. Actually, until they bring back the 'Wagoneer' name, it's Jeep's only other worthwhile name. Compass? Liberty? Who cares. But Cherokee means something, and the 2014 Jeep Cherokee may just live up to the name. 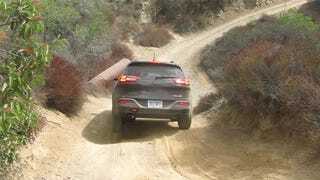 I got a chance to drive a 2014 Jeep Cherokee recently, and most of that driving was off-road. I didn't get to spend a huge amount of time in it, just a few laps around a challenging and reasonably long off-road course and a short on-road jaunt. The good news is that I don't think the new Cherokee is the grocery-hauling soft-roader many feared it would be. The bad news is most of the people who buy these will use it for just that. But let's not focus on that: in the context of this review, we're all young and beautiful, and SUVs are used for adventurous jaunts up the sides of rocky precipices to view panoramic sunsets, under which love is made. Sound better? One of the first surprises about the 2014 Cherokee is that I think it looks pretty good in person. I admit, I didn't think that when I saw the first leaked pictures. I thought the front end looked like an angry snake with complicated orthodonture. But in person, it feels more modern, a bit aggressive, but less overdone than I feared. I still find the light arrangement confusing — the thin, raked upper lights are the running lights and turn indicators, and the almost ignorable lights below it are the headlights. I'm not exactly sure why this causes such cognitive trouble for me, but my brain wants to assign the lights I read as "eyes" as the actual headlights. That's probably just my idiosyncrasy, and if you don't think about that, the front face works fine. It's close to what the Juke does, and the Phantom Corsair did years before that. The side and overall proportions aren't bad. It's not too big, the overhangs are pretty minimal, and there's enough modeling in the surface to keep it from being too boring, even if it would be hard to pick out the profile from a line of Touregs. I'm less sure about the rear — I like the strong horizontal character line, but I don't think the horizontal taillights work. I'd rather have seen some chunky vertical units that took a bit of a cue from the original XJ Cherokee. The press release says those taillights were "designed to kick air off the side of the body," so I guess they have a job to do, keeping that freeloading air from hitching rides. Inside, it's a far cry from the old fake allen-head bolts of the old 80s Cherokees, and everything feels pretty upmarket and of decent quality. You're not going to be fooled into thinking you're in a Range Rover, but for the money it's quite good. It's interesting to note that we're getting closer and closer to LCD dashboards for all cars. The Cherokee has a nice high-resolution unit between the speedo and tach, and all other gauges, like fuel, temp, etc. are displayed virtually, with skeuomorphic needles and all that, on screen. There's another good-sized LCD in the nav/entertainment/camera screen in the center of the dash. Also, the new Cherokee has what may be the fattest, roundest shift knob I've ever seen. Maybe that's because you need a really plump knob when you have nine freaking gears shifting around in there. I'm not sure. There's plenty of little storage pockets and cubbies, and the front passenger seat even lifts to reveal a nice storage bin. The rear seats are comfortable, and the rear bench is adjustable as well as split, so you can slide forward and back each half of the seat to maximize cargo room or legroom as you see fit. There's two main trim levels for the 2014 Cherokee as well: Limited and Trailhawk. Limited is the more refined one that's unlikely to drive over anything more challenging than a forgotten picnic, while the slightly beefier-looking Trailhawk, with its big red towing eyes and chunky bumper plastic is the off-road choice. The Trailhawk also comes with a number of off-road modes and features like hill descent assist. On the off-road course, the Trailhawk did a pretty credible job, especially when you think about it as something based off the transverse-engine, FWD, unibody Dart platform. The hill decent assist worked very well for navigating very steep, rock slopes, and the 3.2L V6's 271 HP/239 lb-ft of torque gave plenty of power. The still problematic-to-build 9-speed transmission and 4.083 ratio axle seemed to give good climbing ability over deep holes, steep slopes, and rocks. "most won't do anything like rock crawling. But they need to know they have the best hardware." Which is, of course, a bit absurd, but that's sort of most SUVs in a nutshell. On road, it's car-like and mannerly in the way it drives. It's FWD in 2WD modes, but I was told the engineers took the time to make it feel like a RWD car. I wasn't really able to do any driving to really test it out, but I can say it accelerates well, shifts pretty smoothly, and doesn't feel top-heavy or overly ponderous. When you consider that these should sell for right around $25 -$28K (they start a bit lower, but 4WD is $2 grand and you may as well get that, right?) I'd say Jeep has a pretty solid shot at doing well with the new Cherokee. 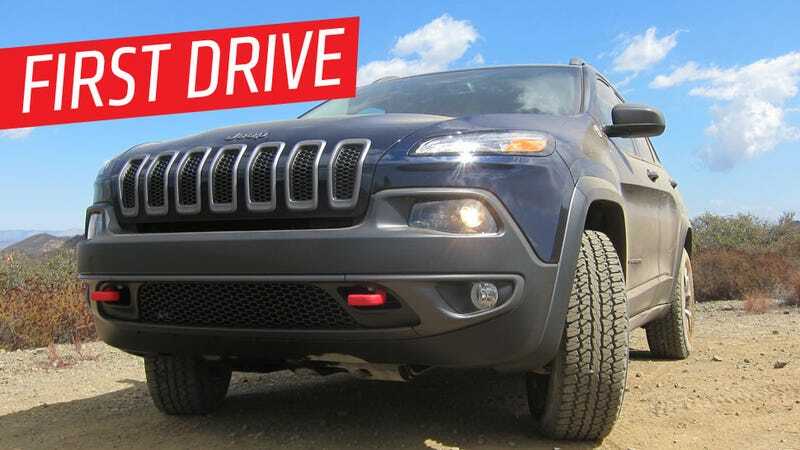 You get a lot of Jeep for your money, and it actually does seem to work off-road, if Cherokee buyers ever do manage to find themselves out there. Is it a worthy replacement for everyone's beloved, boxy, Renault-penned XJ Cherokee? I think so.